It is obvious that fish or any other aquatic creature living in a freshwater aquarium would require a particular set of conditions to survive in the artificial environment. Fortunately, you can easily start a freshwater aquarium if you have the required equipment. Decide which fish you would want to keep in the aquarium and accordingly acquire an appropriately sized aquarium. Keep in mind that it would be easier to maintain and take care of a large tank as compared to a small one. Thoroughly rinse the aquarium with water from a hose. This will remove all dirt particles accumulated on the tank’s surface. Position the tank on its stand. Make sure that the stand is firm enough to support the tank’s weight after you add water to it. Unless you plan to use a cheap immersible or submersible heater, this is the time to set the heating system. Be sure to follow the manufacturer instructions at all times. Get rid of dirt and other impurities accumulated on the gravel and rocks by rinsing them in a bucket full of water. Cover the tank’s base with gravel and position rocks in the gravel as desired. Set the water filter and heater according to the manufacturer’s instructions. Leave both the heater and the filter powered off for now. Add de-chlorinated water to the tank. You can either de-chlorinate water by leaving it stored in a bucket for about 24 hours or by using a commercial de-chlorinator. Switch on the heater and the filter now and allow the temperature to rise. At this point, notice the water’s temperature and bring it in the 75 to 85 degrees Fahrenheit range using the thermostat. Leave the tank as is for about a day and then add the aquatic plants. Bury roots of the plants under the gravel with your hand. 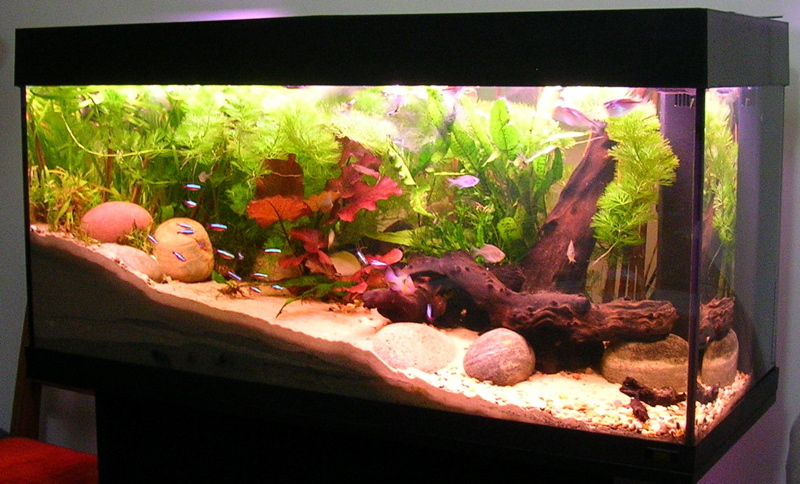 To promote growth of the plants, be sure to leave the light inside the aquarium turned on for about 12 hours each day. Speed up the cycling process by adding a culture of nitrifying bacteria into the aquarium. Introduce at least a couple of high quality fish flakes so that the bacteria have something to feed on. Allow the tank to cycle for about a week in order to allow time for the nitrifying bacteria to develop and then introduce the fish; two or three at a time. Calm the fish after they have been introduced into the tank by turning off the light for a short while. Be careful not to let too much water in the bag find its way into the tank. Keep adding fish to the aquarium every couple of weeks until the tank is stocked to the desired level.